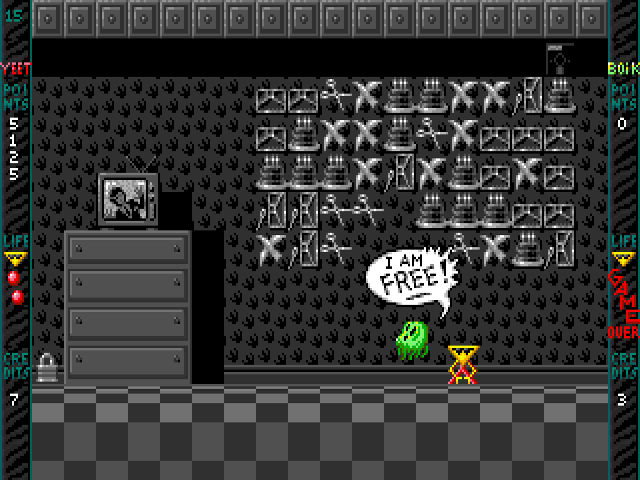 This is a liberated game: it was originally shareware but developer Accursed Toys released a Windows port as freeware (please see the links section below for download). Boppin' is a fun, addictive puzzle game disguised as an arcade game. 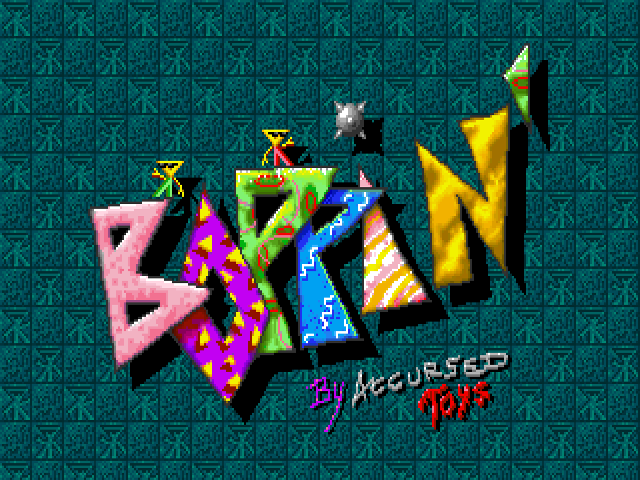 Each screen in Boppin' (160 in the full version) is a unique puzzle with varied graphics. The game is easy to learn, and the built-in instructions are easy to understand. 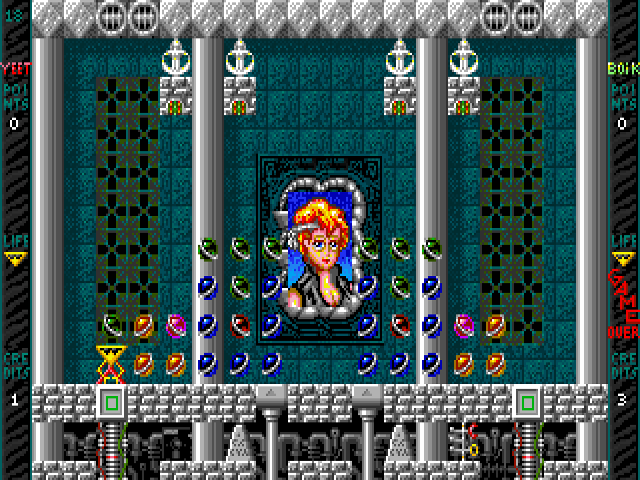 The object of the game is to solve all 40 levels of each of the four episodes, and then defeat the end-of-level boss. Each episode has a lead-in story and different endings depending on how well you did. After episode four there is a special ending that wraps up the entire story. Defeating the ending boss for each episode is made easier by doing well (by accumulating points) on the 40 levels for that episode. 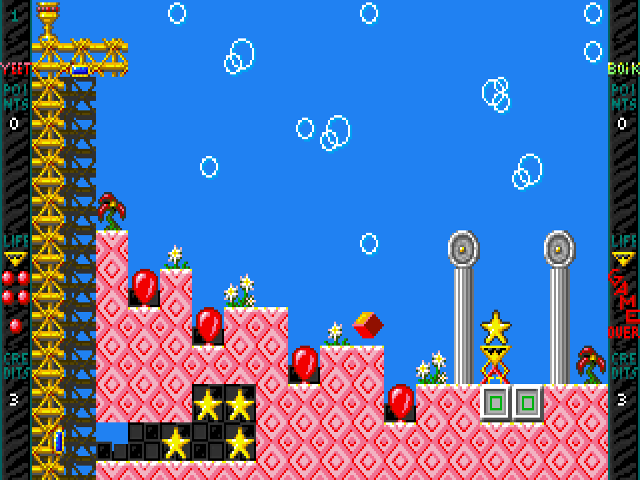 The idea on each level is to grab "bopping blocks" and use them to complete patterns on the level. Certain patterns will free a video game character that you might recognize from dozens of other arcade/action games (i.e. Space Invaders and Pac Man). There are several strategies and skills to learn, and one or two players can play at the same time at the same computer. Every level also has a "mystery spot" (awards 10x extra points for a limited time) and a way to get a "perfect bonus" (if you solve all puzzles on a level). A great feature of Boppin' is its built-in level editor. 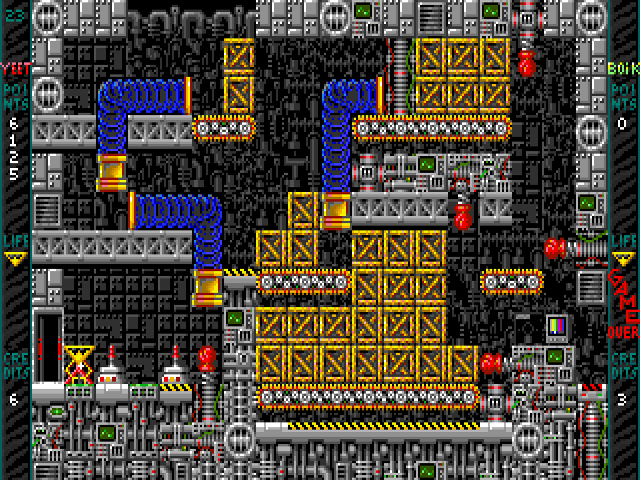 With this editor you can devise any number of new levels, or play levels designed by other players. 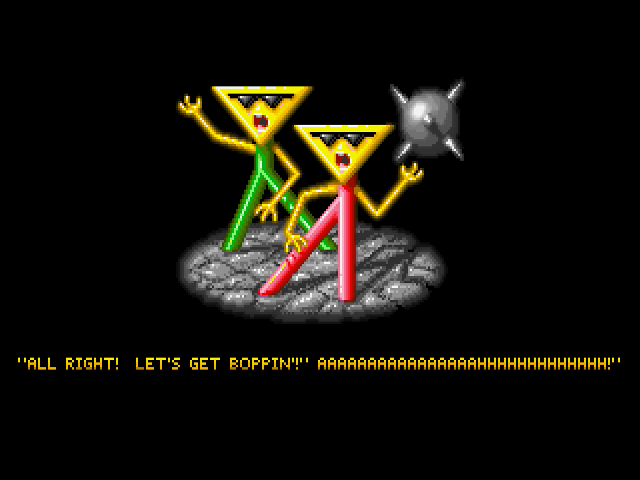 Only the full version of Boppin' can play levels that have been created by other players. Ctrl-L: Moves you to the next level, at the expense of a life. Shift-Ctrl-L: Moves you back a level. This will not work during the final battle.